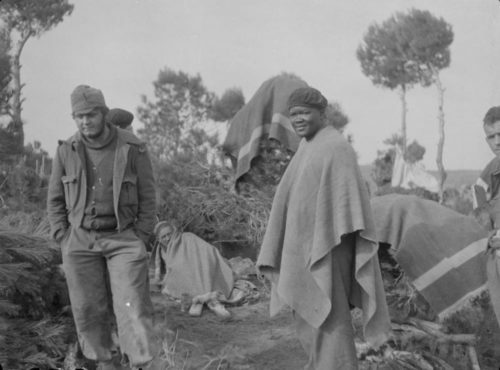 Approximately 90 African Americans fought in Spain during the civil war that engulfed that nation between 1936 and 1939. The war became a proxy war for the European great powers as the Soviet Union supported the newly established Second Spanish Republic while Nazi Germany and Fascist Italy supported the anti-Republic conservatives led by General Francisco Franco. Although officially neutral, approximately 2,800 volunteers from the United States traveled to Spain as the Lincoln Brigade to support the Republic. In the article below, historian Peter N. Carroll tells the story of one little-known African American volunteer, Canute Frankson who left an account of his reason for fighting in the Spanish Civil War. No one, except his friends, had ever heard of 47-year old Canute Frankson in 1937. He’d been born in the Parish of St. Catherine on the island of Jamaica, April 13, 1890. We know little of his early life but in 1917, he immigrated with his wife, Rachel, to the United States, settling for a while in Wilkes Barre, Pennsylvania, working as a machinist. He eventually moved to Detroit, developing his skills in automobile factories. There the crisis of the Great Depression brought him into the labor movement in 1934. Three years later, he was the chief mechanic of automobile repairs in Albacete, Spain, headquarters of the International Brigades fighting against fascism in the Spanish Civil War. How had a middle-aged African American man gotten mixed up in a civil war in a distant country? Canute Frankson’s story is surely exceptional but not entirely unique as he participated with about ninety other African Americans—including some Afro-descendants from Cuba and Puerto Rico—who joined the fight for democracy before the outbreak of World War II. The American volunteers in Spain were known as the Abraham Lincoln Brigade, named after the president who had proclaimed Emancipation and who stood for the legal government of the United States in our own civil war. The Spanish Civil War began on July 18, 1936 and instantly captured international attention. When rebel army officers, led by General Francisco Franco, staged a coup against the elected leaders of the Republic of Spain, they found key allies in Nazi Germany and Fascist Italy. The dictators Adolf Hitler and Benito Mussolini saw Spain as an opportunity to test new weapons and extend their power through Europe. Britain and France, allies in World War I, dreaded a second war and hoped a policy of neutrality would keep the Spanish war from spreading. The U.S., under President Franklin D. Roosevelt, followed their lead. But Spain’s legal government needed assistance if it were to survive and pleaded with other counties for help. Soviet Russia, a minor power in the 1930s, eventually agreed to sell weapons to Spain. More important, the international Communist party urged individual men and women to leave their home countries to join the fight against the spread of world fascism. During the 1930s, the U.S. population numbered 130 million, but only 2,800 citizens responded to the Spain’s plea for assistance. What was it that led African Americans like Canute Frankson to stick out their necks to save the Spanish Republic? Two months after he landed in Spain, Frankson set pen to paper to explain his motives for the folks back home. Most of the African Americans who made their way to Spain were members of the Communist party or an affiliated organization but their political views were tightly linked to their racial identity. Of all activist groups in America at that time, the Communist movement was the most explicitly opposed to race prejudice and discrimination. Consequently, the Abraham Lincoln Brigade was the first fully integrated military body in American history. In all previous wars, black soldiers served under the command of white officers, but in Spain African Americans met no prejudice and many individuals became respected officers. Among these, a Chicagoan named Oliver Law reached the highest rank as battalion commander. He died in battle, leading a racially mixed army at Brunete, Spain in 1937. Langston Hughes, the celebrated writer and poet, went to Spain as a reporter for the African American press and wrote about the heroism of men like Commander Law, Milton Herndon, Walter Garland, and other volunteers, many of whom died or were wounded in battle. He also interviewed the Harlem dentist Arnold Donowa who gave his services to the medical corps and met a young nurse named Salaria Kea. Born in Georgia and raised in Akron, Ohio, she’d encountered her share of segregation and race prejudice. But in Spain she thrived in a non-racist atmosphere, where race prejudice among the Americans was treated almost as a crime. When the visiting writer Ernest Hemingway casually used a pejorative word, an American doctor punched him in the mouth. The Spanish Republic lost the war against fascism and Franco would rule as dictator until 1975. But the same activist spirit that led African American volunteers to fight against fascism in Spain moved them to continue their struggle during World War II and ever after. Nearly twenty black survivors of Spain served in U.S. armies, merchant marines, or health services. After Pearl Harbor, Vaughn Love enlisted the very next day, even though the military remained strictly segregated. “I knew that that was where I belonged,” he said. “I knew since the end of the war in Spain that we would have to face these bastards ourselves.” Nevertheless, both white and black veterans of Spain protested bitterly against race prejudice in the military. The most successful was Sergeant Edward Carter II, who managed to join a combat unit in Germany near the end of the war. In March 1945, he took on an enemy squad, killed at least six and captured two while receiving many wounds himself. The Army awarded him a Distinguished Service Cross, the highest honor given any African American in World War II. Fifty years later, in a ceremony at the White House, President Bill Clinton added a posthumous Medal of Honor to his Carter’s laurels. Although the defeat of Italy and Germany in 1945 sounded the death knell of international fascism, veterans of the Spanish Civil War, whites and blacks alike, understood that the struggle for justice would continue. Many of them served in the ranks of the civil rights movement and fought for racial equality in education, employment, and voting rights until the end of their lives. Peter N. Carroll, The Odyssey of the Abraham Lincoln Brigade: Americans in the Spanish Civil War (Stanford, CA: Stanford University Press, 1994); Danny Duncan Collum, ed., African Americans in the Spanish Civil War: “This Ain’t Ethiopia, But It’ll Do (NY: G.K. Hall, 1992); Peter N. Carroll, From Guernica to Human Rights: Essays on the Spanish Civil War (Kent, OH: Kent State University Press); Peter N Carroll, et. al, eds., The Good Fight Continues: World War II Letters from the Abraham Lincoln Brigade (New York: NYU Press, 2006).